This page details the technical specifications and development of the SAXS beamline. For information about running samples please refer to the Beamline Wiki. Endstation of the SAXS / WAXS beamline. Commissioning of the beamline optics was completed in 2009 and the full range of energies and camera lengths is available with the beamline running a full operations program since mid-2009. Development of the endstation has provided rapid & reliable methods for video camera based sample alignment and a flexible sample stage allows straightforward sample mounting. Sample mounting is continuing to be developed on the beamline with a focus on improved efficiency and higher sample throughput. Two Pilatus detectors are in operation for SAXS (1M detector) and WAXS (200k detector) and may be run concurrently with excellent dynamic range, low noise and short exposures with up to 30 and 150 frames per second. Energy range 5.5 - 21 keV. Optimised for 8.15 keV and 12.00 keV. Energy resolution 2 x 10-4 from cryo-cooled Si(111) double crystal monochromator. Horizontal and vertical focussing mirrors for monochromatic beam with variable focus for different camera lengths. 3 mirror stripes (Si, Rh, Pt) allow full coverage of energy range rejecting higher energy harmonics. Mirrors may be removed for speciality experiments. 2 x 1013 photons per second at 8 keV. 8 x 1012 photons per second at 12 keV. 30 - 60 µrad vertical depending on focal position. Q-ranges are calculated for a 12 keV beam (1.0322 Å wavelength). These scattering angle ranges may be further adjusted by selecting different beam energies (5.2 - 21 keV) or by slightly modifying the camera length by attaching longer or shorter nosecones as in the interactive q calculator for different SAXS camera setups. 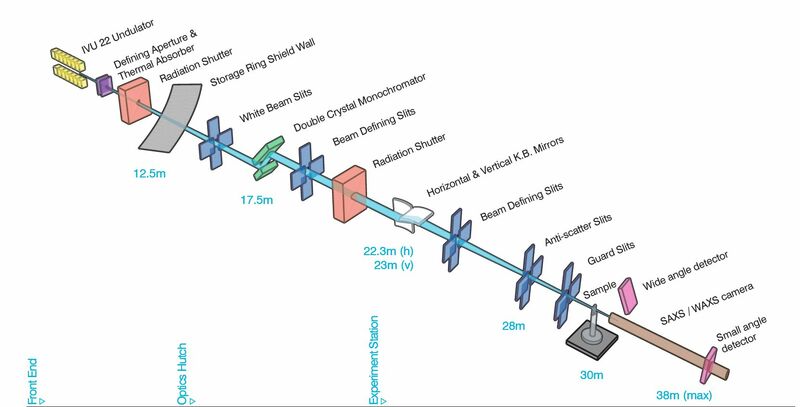 The Q-range and camera setup required for an experiment must be included in applications for beam time. If additional information is required please contact beamline staff. The beamline is well suited to analysing weakly scattering samples due to high flux and low parasitic scattering. An in vacuum sample holder is in development for particularly weak scattering samples; however it is not currently available. How weak a scatterer can be analysed? Below is the measured background intensity at two main camera lengths calibrated into absolute intensity units (assuming a 1.5 mm sample thickness). Above approximately 0.01 Å-1 the background is controlled by air scattering, or for solutions by water scattering (note water = 0.0163 cm-1). Below approximately 0.01 Å-1 the background is controlled mostly by the instrument itself (assuming the sample mount; i.e capillaries, substrates, etc...) produce no scattering. There is a good chance of getting usable data if the net scattering (sample minus background) is a few percent above the instrument background. If you have a reasonable idea of your sample structure, concentrations, among other properties, it is worth doing some planning calculations to check whether the scattering is likely to be observable. Calibrated for a 1.5 mm water path length. The 1.6 m data were collected with a 10 mm longer air path with air scattering, although low, dominating the background above 0.01 Å-1. The beamline is capable of utilising x-rays in the range of 5.5 - 21 keV with the optics optimised for the 8 - 12 keV range. The flux delivered at the sample position is dependent upon the undulator harmonic selected as shown below for the 5th and 7th harmonics. The 3rd, 5th, 7th, 9th and 11th harmonics may be selected to cover the full energy range with somewhat lower flux delivered for higher harmonics and higher energies. Flux at the sample position for 5th and 7th undulator harmonics. The SAXS beamline uses two Pilatus detectors for SAXS (1M, 170 mm x 170 mm) and WAXS (200k, 33 mm x 170 mm) data collection. The Pilatus detectors provide excellent 2D data collection for SAXS and some limited 2D WAXS collection. However, the beamline is not optimised for full 2D WAXS data collection. Time-resolved data collection is also well supported as the Pilatus detectors are capable of collection at 10 Hz (1M) and 30 Hz (200K).